An earlier me would have read poems that referenced micro-shorts and text messages and immediately written them off. That earlier me would have lost out. 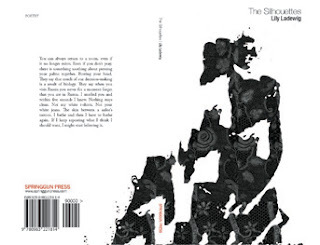 The speaker in Lily Ladewig’s debut poetry collection The Silhouettes won’t let me pigeonhole her. She refuses to be predictable. These poems are fashion previews, but they are also history lessons. They are sometimes yoga meditations, and they are sometimes adventures in free diving. They are often French. And while they usually show us the silhouette, they always show us the body. Poems are often about what isn’t included. And The Silhouettes is a collection of the unfinished line. The series of “Shadowbox” poems spread throughout the book play with space and punctuation. Part of this play is to imply line breaks, but it also plays, as many of her poems do, with suggestion. Just as we guess with silhouettes, we find ourselves finishing the thoughts in lines like, “If I forget to pack enough books//and my lacy underthings” and “To be someone’s cup of tea/or a flight of stairs." No matter what context, these are poems about the body. About a body. A body that’s aware of itself and over-aware of itself. A body that is sometimes surprised by itself. That is not to say these aren’t poems of the mind and heart. These are poems of an entire bleeding person. A speaker who is aware of her body when she is moving through the world, when she is in love and when she isn’t. Ladewig writes, “Like if nobody/looks at my naked body then I will never/be truly naked again.” Nobody takes on a new meaning, and we also begin to wonder, “Then what do these/reflections mean?” When she writes, “Do you know/how many people have told me/that I have a lovely figure?” we remember the gloom a person can have living inside a body, any body. *This review first appeared at Dark Sky Magazine.